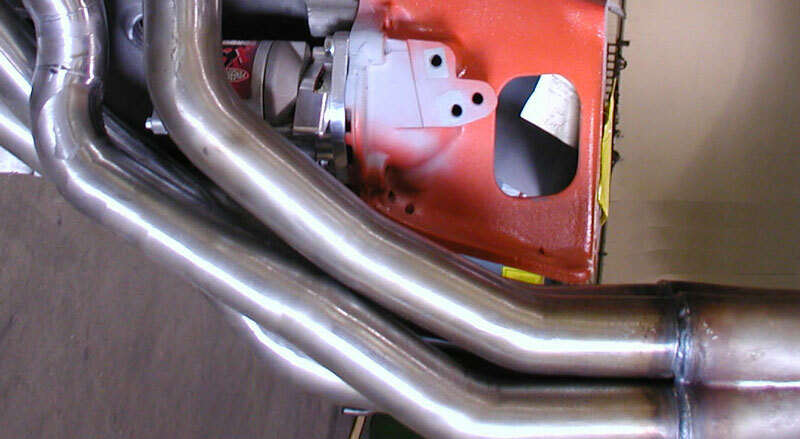 We construct our headers from 16 gauge mild steel tubing. Mild steel is the most common form of steel used to fabricate automotive headers due to its carbon properties which makes for easy forming. Mild steel is weldable, very hard and although it rusts, it is very durable. We offer the following exterior and interior coating options to protect and seal tubes in order to prevent rusting. The ceramic coating options enhance the appearance of your headers and further extend part life. An appealing silver high-luster finish applied to the steel surface to protect against rust, corrosion and withstands temperatures up to 1200°F. Exceeding this temperature will result in discoloration of the header tubes. The thermal barrier is a protective inside coating which increases part longevity by reducing under-hood temperatures by 50 degrees protecting component parts from thermal fatigue. A silver matte finish applied to the steel surface to protect against rust, corrosion and withstands temperatures up to 1200°F. Exceeding this temperature will result in discoloration of the header tubes. The thermal barrier is a protective inside coating which increases part longevity by reducing under-hood temperatures by 50 degrees protecting component parts from thermal fatigue. An appealing silver high-luster finish applied to the steel surface to protect against rust, corrosion and withstands temperatures up to 1200°F. Exceeding this temperature will result in discoloration of the header tubes. A silver matte finish applied to the steel surface to protect against rust, corrosion and withstands temperatures up to 1200°F. Exceeding this temperature will result in discoloration of the header tubes. A bright and shiny decorative chrome finish. Exhaust components which are chrome plated are much more susceptible to bluing, blistering, peeling and corrosion due to extreme exhaust temperatures. 1 Note: Exhaust corrosion will occur if moisture (condensation) is not cleared out of the tubes. Make sure that the vehicle is driven at least 20 to 30 minutes whenever the car is started to completely dry out all liquid / acid that is created by the combustion process in the engine. Failure to do so will cause pre-mature rotting of the tubes from the inside out. We strongly suggest that you use an old set of headers or set of cast iron manifolds for your first engine run / cam break-in. This will insure that you will not damage the coating and void the warranty of your new headers. Header coating damage usually occurs during the first engine run / break-in when the exhaust temperatures exceed 1200ºF. Excess exhaust temperatures are normally caused by excessively rich or lean air / fuel mixtures and / or incorrect ignition timing. (!) Special-Order ceramic coating options: Allow 6-8 weeks for coating process. (!) Non-refundable deposit required to start Special-Orders. Exhaust systems are made from 16 gauge aluminized tubing and does not require coating. Ceramic coating options are available as an option/personal preference. Ceramic coating provides additional protection, performance & longevity. When ordering, add the 2-digit suffix to the end of the exhaust system part number or the exhaust component part number. * Mufflers & Catalytic Converters are exterior coated only. Exhaust-pipes, Mid-pipes (H or X), Mufflers & Tailpipes. 5-pc Mid-section Assembly, Mufflers & Tailpipes. Exhaust-pipes, Mid-pipes (H or X) & Tailpipes. Reducer/Adapters, Mid-pipes (H or X), Mufflers & Tailpipes. Reducer/Adapters, Mid-pipes (H or X) & Tailpipes. *Exception: Mufflers coated external only. Reducers or Adapters ...2 pcs. Exhaust-pipes or Shorty adapter pipes ...2 pcs. H-pipe Assembly (mid-pipes) ...2 pcs. X-pipe Assembly (mid-pipes) ...3 pcs. Mufflers* ...2 pcs. *Mufflers coated external only. Aluminized Exhaust Tips ...2 pcs. Prices do not include Shipping, Handling or California Sales Tax, if applicable. Designed and maintained by Tube Technologies, Inc.